Lots more hand-helds in everyone's hands, Balinese and tourists alike. Thumbs rule! Not sure if this is a good or bad thing (not for me to say...); just "..is..."
Building, building, "Land For Sale" ("...di jual tanah!") Bali was overbuilt probably 10 years ago, and the building just continues. Hotels; private residences. Everyone wants to "contract" you some land (usually just enough for the footprint of a home in the middle of the sawah (ricefields) with a path to it.) 10, 20 year contracts... Pays more in the short run than farming, and for the first time ever in Bali, the island where rice is king and whom has for years exported rice, now has to import rice from its less tourist- impacted Indonesian neighbors. What happens to all these small homes, luxurious homes when their absentee "owners" are in their home country? They go on Airbnb, HomeAway, Roomarama, Holiday Lettings, etc. A plethora of lodging is now available, and no one is really filling their spaces. New at Rumah Kartika: Beautiful sandstone tiles for the pool deck & lounging areas; new pool divans; brand-new alang-alang (field grass) roof with new bamboo superstructure for the "Bale Begong" (our yoga/lounge pavilion halfway down vbetween the house & pool); new bedcovers; new stylish mosquito nets for the beds (more of a "style" thing than need, as mosquitos are very rare in this area of Ubud, and the bedrooms are svreened and A/C anyways...); new pad and superstructure for our family temple... The painting of all the entry and bed & bathroom doors effected a year ago looks magnificent..! This is, by my reckoning, the 42 nd time I have traveled back & forth to my home in Bali. It is truly returning home; I am always in awe..! New at the house since last year: 1. All new creamy sandstone tiles totally around the pool deck and lounge area; new pool lounges. The pool was always a refuge; now it is a stylish refuge! 2. Our "Family Temple," built on that corner of the land nearest the Holy Mountain, Mt. Agung, has for years been looking more and more like the leaning tower of Pisa as the ground has shifted underneath. At my last visit a year ago I contracted for a move of the temple 10 feet to the East to more stable ground, re- building the small temple courtyard and shifting hydraulically the at least 2-ton "family temple" structure. With the blessings of our Banjar priest both prior to and upon completion of the task, we now have a "new" and more stable structure from which to call the Gods attention to our humble abode. Bonny and I joyously celebrated both our return to Bali and the "new" temple with a small ceremony on an auspicious date, January's full moon ("purnama"). New for this year? Our "bale begong" (yoga/exercise/ "hang-out" gazebo on a level just above the pool...) needs an entire new roof & superstructure. This will be done (alang-alang, or "grass" roof with coconut wood beams and bamboo rafters) in the week after we leave, before our next guests (via Airbnb) arrive January 21st ! Unchanged (year-after- year-after- year!) s the pleasing countenances of Made and Ketut, providing upkeep, counsel, tasty and healthful cuisine, a sparkling pool and continually exquisite gardens and environs. Bapak Parig continues to "tread water" after his stroke of 4 years ago, but has lost no ground. Life goes on in Bali..! Bali, January 2016. Lots new at Kartika Dharma. Where to begin?? Bali is definitely becoming more “travelled,” and is on everyone’s destination map. No wonder, it remains a special place. One thing has not changed - still - and that is truly amazing! Our house/estate/whatever you wish to call my “refuge” above the Campuhan River Gorge somehow remains the same, suspended in time. I walk down the path and suddenly am in an old-time, village life world, my home looking the same as it has for > 35 years (well... it has a new roof, A/C, mew mattresses. Newly tiled pool & deck, etc., but its essence and ambiance and patina remains the same. What a treasure! Whole new tile decking for the swimming pool. New large flat screen TV and DVD player upstairs in Lounge area. The most fun and amazing project was hiring the services of the son of a long-time (35 year) Balinese acquaintance (father is a painter, and son recently graduated from Art School...) to paint light and flowing scroll work, bamboo, flowers, etc. on the insides of all the big antique doors; touch up the scroll work on the outside of the doors, and similar paintings on the doors to the bathrooms and entry-way. Delightful work and fits right into the ambiance of the house. I’ve posted a photo of the entryway door, both front \(entering) and back (leaving), as well as one with Andy (that’s his name) at work..
New bedcovers for the beds. And.... Ketut is still the best cook this side of Penestanan!! ...That’s all for now from Bali. 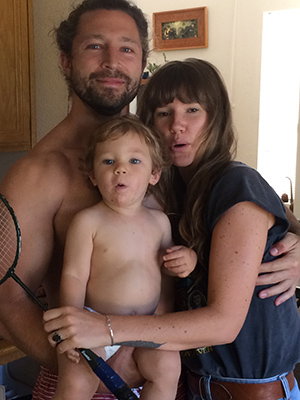 My son, Lauren, along with Amy and my grandson Myles (now almost 2) will be in Bali most of February, and I expect that he and Amy will put their own “stylin’” touches here ‘n there... HAPPY 2016! What's new at "Rumah Kartika Dharma" for Summer & Fall, 2014? Actually, it's more "...what's old..." The slow, mindful pattern of Balinese life continues within the safe, still environs of "RKD," where, with the exceptions of occasional upgrades, life is as it was when the home was built in 1979/1980. Occupancy continues to average ~ 75% annually, as it has for years. Guests so far this year are from USA, Canada, Australia, Singapore, France, Belgium and New Zealand. The waterfalls are the same; still no building across the gorge. The only activity there is the rice farmers tending their paddies, and the occasional wafting smoke when there is a cremation at the cremation grounds, hidden by stands of palms and other indigenous foliage. Dateline July 2014. Rumah Kartika Dharma continues mellow, secure, and peaceful. It continues to be that rarity in present-day Bali: quiet, serene, well-located and cared for by Made, Ketut, and their family who have now worked at the house for > 33 continuous years!!! Thanks Michael for a fabulous stay at your wonderful home. We had such a fantastic time. We loved Ubud! You have such a fabulous location. Some of our favorite things, in addition to your house: Ketud's cooking, family yoga class at Intuitive Flow, meals at Yellow Flower, hiking through rice fields and discovering Pomegranate Cafe, wandering around Ubud and enjoying all the art, watching World Cup games in the middle of the night at the open air bar down the street, trip to Batur Volcano & hot springs/Coffee Plantation/Water temple, afternoon at Elephant Sanctuary (WOW! ), and massages at your house. Truly loved the Balinese people, the culture, and warm hospitality. Hope to return! We are having a great time at your Bali home and thank you so much for this opportunity! Made, Kutut and Wayan have been wonderful. Made is pure entertainment, Kutut feeds us with her expertise and Wayan is our driver. My darling grand daughter is with us now and we are having a terrific time together. She loves it here! I would like you to tell me exactly how much to leave for Made and want to leave more than is expected. They are precious people. We just got back to Melbourne after two weeks at your wonderful home in Bali. I just wanted you to know how much we enjoyed our time there. 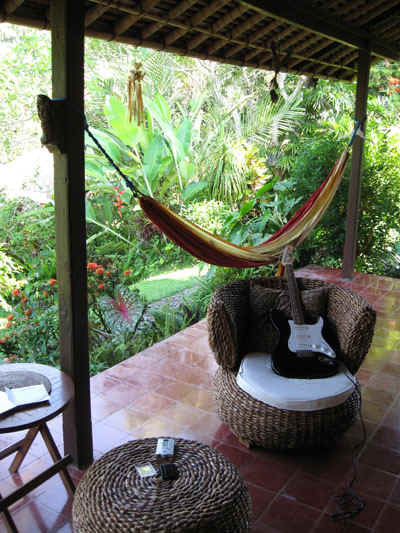 The house is in a great location and close enough without being too close to everything in Ubud. 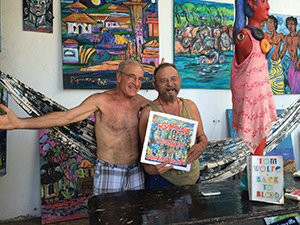 Made and Ketut are such wonderful, kind and generous people. Ketut is such a good cook that I managed to put weight on, whereas most people go to Asia and lose weight. Ah well, the food was too good to resist. One of the best experiences we had was going to Made and Ketuts' daughters wedding which was such a privilege for us. I've written a review for trip-advisor which you'll see with a rating of "excellent". What a blessing ... We were able to return to Michael's house in Bali for a second time and spend a few weeks. Actually the first time we visited was in 1982. It is as beautiful, as peaceful, as quiet as it was in 1982 and 2001. This time we were there without teenagers. 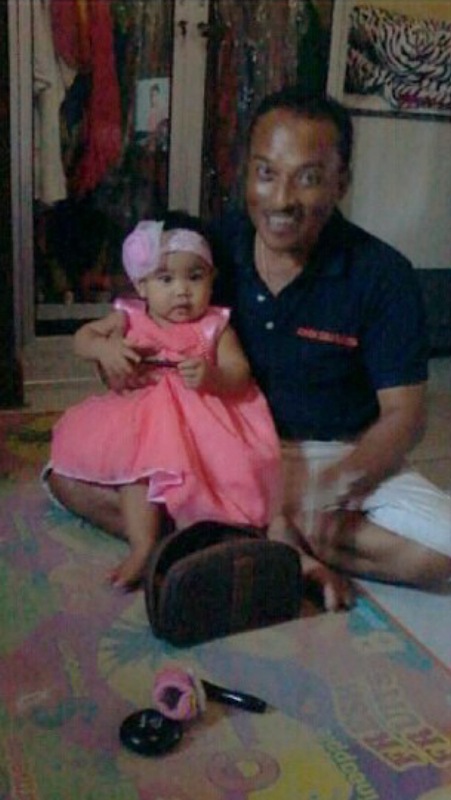 Made and Ketut made our visit a joy. We went on to Flores afterwards and I can definitely say the best food we had in Indonesia was made by Ketut and I cook for a living so I know food. It was wonderful to reconnect with Made, Ketut, and Pak. Pak, Made's father brought me campaka flowers as well as gardenia flowers everyday. I love him so much. Bali is very busy these days so the joy of returning or never leaving Rumah Kartika made our stay in Bali perfect. The beautiful rice paddies across from the house are still green and stunning. Walking distance to dance ... And other adventures await outside the gate. A beautiful house, caretaken by kind and helpful people... Oh I wish I was still there. Oh and Made's language lessons.... Ketuts great cooking and many kindnesses finding a tailor, Made's help with Drivers. Made's brother Wayan is a great driver and also an excellent language instructor. I keep them in my heart. I hope that the level of stress from tourism spares them pain. If you have any questions please feel free to contact me. 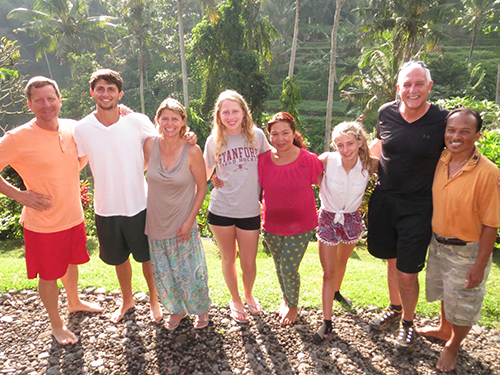 My son, Lauren David, and his girlfriend Amy spent January 2013 at our home in Bali. Most all the photos in this link were taken at the house. 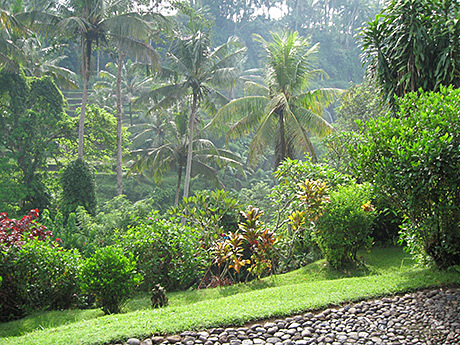 We are settled into your amazing place in Ubud and couldn't be happier! I apologize for the delay. But unpacking for the first time in 5weeks put us into relax mode. Then we rented bikes and have been exploring for two days. What a great situation. We love the location, Penestanan is great and the house is just perfect for us. Love the view and privacy, simply amazing. Food and meals have worked out great. And there is no lack of things to do both culturally and self indulgent as well. I have paid Made for the remainder of 13 nights in total. We had planned on two weeks (checking out on the 15th) but spent an extra night exploring the island as you know. I plan to leave on the 15th as planned to visit Nusa Langbongan island where we will do some more snorkeling etc. The beaches are just too fabulous to pass up. Something we really cannot experience near home. My girls have fully embraced the beauty of snorkeling. If we simply cannot leave on the 15th…I will try my luck at contacting you to see if we may stay another couple of nights. In the meantime, please accept my thanks for such a lovely place and to the universe for keeping the developers away from the amazing hillside across from you and making it all available to us at this time! Everything went very well. We enjoyed our stay in Ubud a lot, especially with the good help from Made and Ketut : super nice people ! Spring in Bali. Well... there really are no distinct "seasons" here, 6 degrees south of the Equator. It's rainier ~ November through February, a bit warmer March - May, but usually it gets light at 6 a.m. Most days in Ubud are ~ 75-90 degrees and humid, frequently clouding up and raining in the afternoon and evening, only to be bright, sunny, and crystal clear in the a.m. The project for my most recent trip to Bali (late February/early March) was to contract a new roof on the small cottage where Made (the house manager) stays, and where occasionally "overflow" guests sojourn for a day or 2. Nice to have things dry again! Sitting on the front veranda, the only sounds to hear are birds-birds-birds, with the periodic interruption of a large beetle buzzing, the crow of a rooster or howl of a dog, of the distant cords of a Gamelan somewhere. No traffic noises back here above the gorge. So, what's changed since last year? Well, I finally made it (3 times!) to Jazz Café in Br. Tebesaya. What a treat! World class jazz 'n blues in Bali just 10 minutes from the house. The good restaurants are still good and new ones popping up all the time. Never a bad meal. Shopping is still outta sight. I bought a Buddha for Gabriele, a new dumbek for Caleb and djembe for Sam, 2 more gold bracelets from one of the myriad of gold shops on Jl. Hasanuddin in Denpasar for Michele. Some clothes for Lauren. Had simple lapis bracelets strung in the shop just up the road for all of us, and leather/silver bracelets for all the boys. Soap and silk scarves for all the ladies and girlfriends. And of course my annual supply of bamboo "tik-kilks" (melodious wind chimes) from the "pasar" in Ubud. Wayan (Made's eldest son, 11 months older than Lauren) is planning on building his own home on a tiny plot of family land given to him by Pak; we talked about plans, how to get the most from such a small plot. He'll be getting a loan from the Banjar; I told him I would help out, but first he must come up with 10% funding on his own. Typical 28-tear-old, figuring he could borrow it all & worry about paying it back later... Kadek ("Tinny") is doing great at her job at Kupu-Kupu Barong, and is my official communicator with Made via email or texting - fully into the 21st century (Made, although he has a cell phone, is definitely not Internet savvy... ). ...Pretty much status quo for 2012... No price changes but will give steeper discounts to guests "filling in" open times in-between other bookings... I will offer these to you when available. Occupancy is stable at ~ 75-80%. I've just began listing on "Roomorama", so occupancy percentage will rise... We have now fully changed out our roofs, which are now 100% Balinese tile. We do miss the old grass roof ("alang-alang grass"), but had to switch to tile as the quality of the available alang-alang has deteriorated to the point that our previous roof lasted only 3 years!